The Everything Axe set for Strat and Liberator system, pre-loaded into a white, three-ply pickguard that will add a ton of versatility to your guitar. This 3 pickup set will turn your Strat into the ultimate versatile workhorse guitar with its wide variety of tonal options. The JB Jr. bridge model will take your Strats bridge position to a whole new level. This high output single coil sized humbucker will give you nice crunchy chords, and screaming lead tone with that classic upper midrange cut. 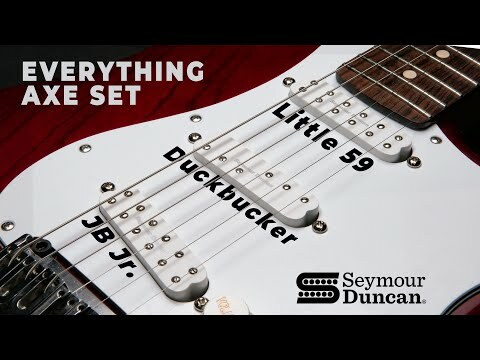 There will be tons of bright harmonic sparkle, and a tight focused low end.The middle position Duckbucker there to add that sparkly single coil tone in positions 2, 3, & 4. Its unique, split-pole pattern with 3 poles on each coil, also contributes to the single coil bounciness and snappy low end. The Little 59 in the neck position has a nice, balanced P.A.F.-like response for big, full chords, and fat, punchy solos. Has that pleasing blend of warmth and bite when you dig in.Any future pickup changes you decide to make will be a snap becuase this pickguard comes equipped with a Liberator solderless system that makes swapping pickups fast and easy.Hand built in Santa Barbara, CA, these pickups come with a 4-conductor lead wire, and are wax potted for squeal free operation. The pots, selector switch, and cap, are all high quality, and we use vintage style cloth push back wire for all of the connections. This white, 3-ply pickguard uses an 11-screw hole “USA” pattern. Can you play a gig with one guitar?